The WJTA is international in scope with corporate and individual members throughout the world. Membership is comprised of waterjet users, manufacturers, distributors, researchers, regulators, and consultants. The primary goals of WJTA include enhancing communication within the industry: facilitate cooperation between government, industry, university, and research institutions; foster foreign and domestic trade in jet cutting and cleaning products and services; and study and advance the arts and sciences of jet cutting of industrial and geological materials, as well as industrial cleaning. The WJA has been committed to publicizing the enormous benefits (and potential hazards) of high pressure water jetting for many years. Based in the UK, The Water Jetting Association publishes a Code of Practice that sets the standard for the best and safest practices in the water jetting industry. TurtleSkin WaterArmor has been CE type approved by Centexbel, Montoyerstraat 24, B-1000 Brussels, Belgium (notified body 0493) according to the directive 89/686/EEC. Certificate number: 00101317. 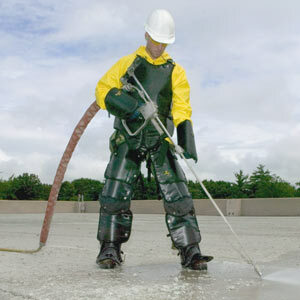 We confirm that this PPE product is identical to the one which has been subject to the type approval.